Hope comes alive on Friday nights. $20.269 million on 2667 screens. In Texas, high school football is more of a religion than a diversion, and we get a look at that culture in Friday Night Lights. Set in the west Texas community of Odessa circa 1988, the Permian Panthers enjoy a prominent status in the community as well as a long record of success. Coach Gary Gaines (Billy Bob Thornton) receives a big salary and works under bigger expectations. 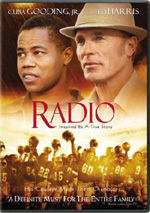 The first part of the movie introduces us to players like quarterback Mike Winchell (Lucas Black), arrogant, cocky, and ultra-talented fullback Boobie Miles (Derek Luke), third string runner Chris Comer (Lee Thompson Young), brainy tight end Brian Chavez (Jay Hernandez), sullen defender Ivory Christian (Lee Jackson), and tailback Don Billingsley (Garrett Hedlund), the son of abusive local legend Charlie (Tim McGraw). Lights starts with the beginning of training camp in early August. Gaines makes his expectations clear from Day One: he plans to win the state championship. The movie follows the team’s path as well as various interpersonal relationships and obstacles. The main impediment occurs when Boobie gets injured in the first game. The team has to work without him, and that allows Comer to come to prominence. We watch Boobie try to return while the team marches its way - awkwardly at times - toward the championship game. 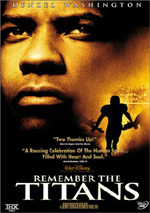 Remember the Titans this ain’t, and I mean that as a compliment. Don’t interpret the statement as a slam on Titans. That flick offered an entertaining tale of racial tolerance and I enjoyed it. However, it clearly displayed its roots as a Jerry Bruckheimer project, so it didn’t exist in the real world. On the other hand, Lights flouts its realism, painfully at times. Essentially shot in a documentary style, it doesn’t focus on much of a story. Yeah, we follow the team as their season progresses and they go to the playoffs. However, that side of things works as little more than a backdrop to the personal lives of Gaines and the players, at least until the time of the championship game. That’s when Lights turns more conventional. I won’t reveal what happens in the state title contest, but the team does get there. Those scenes - as well as the playoff montage - seem substantially more conventional than the rest of the movie. I probably should dislike that, but by the point at which the film turns more typical, I’d bought into it so heavily that I couldn’t complain. Indeed, the ending acts as a release to let out all the pent up feelings of the prior 90 minutes. It provides a surprisingly powerful emotional impact, though not for the expected reasons. As I said, I don’t want to get into the specifics, but things veer from the usual course somewhat, and it works wonderfully. Actually, much about Lights shouldn’t work, but it does. The documentary style should seem self-conscious and contrived. This feeling never occurs, however, and the format fares wonderfully. It makes the events immediate and gives the movie a real “fly on the wall” tone. It helps that the events usually stay low-key. Not a lot of histrionics and dramatics occur during the story. They pop up occasionally, but the movie mostly sticks with a realistic tone and doesn’t go for affected theatrics. It doesn’t wallow on the various problems experienced by the participants; it develops them appropriately but doesn’t shove them down out throats. Yeah, some cheesy elements appear. For example, the movie so heavily sets up Billingsley as the butterfingers who needs to earn his dad’s love that his path becomes inevitable. We also get the team in the Big Game against the Superior Opponent Against All Odds. In addition, the movie takes some significant liberties with the real situation, mostly in the final game. Permian did play Dallas Carter, but according to what I’ve read, it was in the semi-finals, and it was a much lower scoring affair. It also didn’t take place in the Astrodome - maybe that was an homage to The Bad News Bears in Breaking Training. Nonetheless, these minor complaints don’t substantially impact on the movie, as it almost uniformly remains a joy to watch. I went into Friday Night Lights with low expectations. 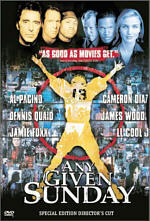 For one, its director had never made an even halfway decent theatrical movie before, and when I saw a rave from Larry King on the DVD’s front cover, I figured they used his praise because no one else of prominence liked the flick. (Actually, it got a lot of good reviews, which made it odd that they’d stress King instead of a real critic.) Despite my misgivings, I found a thoroughly entertaining and involving movie. It added a new spin to an old subject and was a real winner. 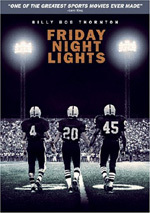 Friday Night Lights appears in an aspect ratio of approximately 2.35:1 on this single-sided, double-layered DVD; the image has been enhanced for 16X9 televisions. No significant problems popped up during this strong transfer. Sharpness consistently appeared crisp and detailed. At no time did I discern any signs of softness or fuzziness, as the movie always came across as well-defined and accurate. Moiré effects and jagged edges showed no concerns, and only a little light edge enhancement marred the presentation at times. Print flaws were essentially non-existent. Some stylistic grain appeared but the film otherwise lacked any defects. To match the arid west Texas settings, Lights went for a rather bleached look, which meant that colors usually appeared desaturated. Nonetheless, they came across as accurate and distinct within those parameters. The hues rarely looked natural, but they weren’t supposed to generate that appearance, so I was satisfied with the low-key depiction found during much of the movie. Black levels seemed to be deep and rich, while shadow detail was clear and appropriately opaque. Lights was a solid image. For the most part, the Dolby Digital 5.1 soundtrack of Friday Night Lights was satisfactory, but it never became anything special. The soundfield stayed with a subdued orientation. Even during the louder scenes, not a lot went on here. Football games depicted decent involvement and activity but didn’t demonstrate a very immersive experience. In the front, elements moved smoothly across the speakers and blended fairly well. Music also showed reasonably good stereo delineation. The surrounds added general reinforcement and not much else, though they were acceptable for the sports sequences. Audio quality varied, largely due to the erratic sound of the movie’s omnipresent music. Low-end response was lackluster, as the score didn’t present a lot of bass. It sounded clear and bright otherwise. Speech always seemed natural and crisp, with no edginess or issues connected to intelligibility. Effects mostly played a small role, even during the football games. They were acceptably accurate and dynamic, and they presented the most punch in this track. I would have liked greater oomph for the music and a more active soundfield, but this track remained suitable overall. To start the extras, we locate an audio commentary from director Peter Berg and author Buzz Bissinger. Both sit together for their running, screen-specific discussion. Despite some minor flaws, the pair provide a largely entertaining and informative chat. The negatives stem from a little dead air as well as a bit too much praise. Otherwise, the commentary remains lively and engaging. Both men are cousins, and their relationship adds spice to the proceedings as they crack on each other. Bissinger carries most of the load here, and he gives us a good comparison between real events and the movie’s liberties. Berg covers some filmmaking details like casting, locations, and the film’s look, but the subjects broached by Bissinger take prominence. Since the author’s quite forceful and focused, that’s fine, and Bissinger’s not shy with his opinions. This creates a humorously embarrassing moment when he inaccurately predicts a St. Louis victory in the World Series; they taped the commentary between games two and three. Bissinger also makes me glad I liked the film. He really attacks critics who dismissed it; I’m worried that if I’d joined them, he’d track me down and beat the crap out of me. Anyway, the track occasionally drags, but it usually entertains and educates. 10 Deleted Scenes run a total of 21 minutes and 47 seconds. Some of these extend existing sequences, and the new ones really do little more than reiterate themes delved into elsewhere in the movie. They’re moderately fun to see but they add nothing and deserved to be cut. An odd piece, Peter Berg Discusses a Scene In the Movie lasts 68 seconds. We see the director on the set as he lets us know about a reshoot. We then watch the full “Buddy Burger” sequence. The intro tells us very little, so I couldn’t figure out the point of this feature. Slightly more interesting is the four-minute and 19-second Player Cam. Supporting actor Ryan Jacobs videotaped downtime on the shoot and the results got packaged into this compilation. It’s watchable but not very insightful. For the next featurette, we get Tim McGraw: Off the Stage. It runs six minutes, 11 seconds as we hear from the singer turned actor as well as Berg, producer Brian Grazer, and actors Billy Bob Thornton, Lucas Black and Garrett Hedlund. McGraw tells us a little about his transition from music to film, but mostly this piece stays fluffy. It indulges in praise for McGrawy and not much else. At 23 minutes and 31 seconds, The Story of the 1988 Permian Panthers is the most substantial video supplement. It presents movie clips, archival elements, and comments from Berg, Grazer, Bissinger, Hedlund, Black, McGraw, Thornton, newspaper columnist Ken Broadnax, former Permian cheerleader Marca Washburn, referee Randy Brinlee, trainer Tim “Trapper” O’Connell, senior assistant principal Buddy Hale, real players James “Boobie” Miles, Don Billingsley, Mike Winchell, Tyler Stribling, and Brian Chavez, and actor Derek Luke. To call this featurette “the story of the 1988 Permian Panthers” isn’t really correct, for it doesn’t attempt to accurately cover the team’s season. Instead, it mostly gives us some real-life notes from the major players featured in the film. They provide nice perspective, especially in the case of Miles. We can see the pain his fate still causes him as he continues to wonder what might have been. The program is ultimately a promotional piece, but it’s a fairly interesting one. Some of the archival material helps, with cool elements like the real coin toss that got Permian in the playoffs. The standard text Cast and Filmmakers appear next. We get listings for actors Thornton, Luke, Jay Hernandez, Black, Hedlund and McGraw as well as entries for Berg, Grazer, Bissinger, executive producers James Whitaker and John Cameron, and screenwriter David Aaron Cohen. These mostly fall in the “annotated filmography” category. They flesh out movie listings acceptably well and are worth a look. The package doesn’t include the trailer for Lights, but a few ads pop up at the start of the disc. We get promos for Ray, The Motorcycle Diaries, Miami Vice and Las Vegas. Chalk up Friday Night Lights as an extremely pleasant surprise. I expected the usual rah-rah feel good sports flick; instead, I found a movie with a harsh focus on reality that made it consistently believable and realistic. The DVD presented strong visuals with decent audio and an erratic but mostly solid set of extras. I highly recommend this terrific movie.